RBI will allow banks to be created “on tap” in the private sector. Meaning if you qualify, you can go apply for a license – much like a driving license – and get one. 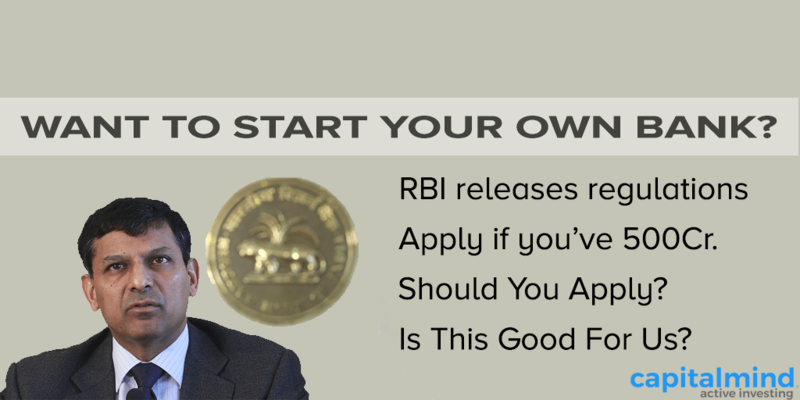 The previous model was: you waited till the RBI told you it wanted people to bid for a license. This wait could be for 10 years. Then you applied and you waited, usually for two or three years. Then you were told that your fingernails were dirty and please clean them and reapply. And then you died and no one remembered you for it. Why not? It’s tax free and most importantly, you will learn from the process that you necessarily need to have Rs. 500 crore lying around. The “on tap” doesn’t mean that it flows like beer – you have to demonstrate you can pay the cover charge first. Eventually this means that banking will no longer be restricted to the top few names you keep hearing of. But to drive them out of business, the new banks have to eat at their franchise and make it so technologically simple to bank that people migrate. They’ll have to lend at lower rates, borrow at higher rates, and squeeze margins. How Much Cash Do Banks Keep With RBI For CRR? Chart: How Much Have Banks Borrowed From RBI Daily?